SlipAlert, the British Standard slip test, is user friendly and accurate and guaranteed to help reduce slip injuries in your business. 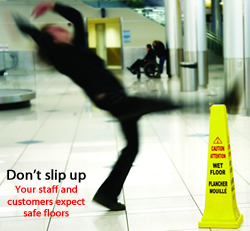 Don't wait till someone slips and falls... contact SlipAlert today. If you are worried by slippery floors, slipping accidents or slip claims then you need SlipAlert. Contact Jenny for information. A step change in floor safety. SlipAlert is faster, easier and more versatile than traditional slip testing. SlipAlert measures slip risk, results correlate with Pendulum Test Values (PTV) and Coefficient of Friction (CoF). SlipAlert is guaranteed to accurately assess slip risks. You can reduce slipping accidents, slip injuries and slip claims. Buy SlipAlert! Wear, contamination and the effects of cleaning and maintenance can significantly alter the slip resistance of your floors. Even good quality anti-slip floors can change over time. Don't wait till someone falls to test your floors. The only way to be proactive is to monitor slip risk regularly. Regular testing with SlipAlert can be done by anyone on any floor. Proactive testing will tell you about the performance of your floor and about the effectiveness of cleaning and maintenance. Don't just buy safety flooring, buy safe floors by testing the slip risk before you buy. Maintain safer floors by monitoring cleaning and maintenance. Be proactive. SlipAlert is one of only two British Standard floor slip test machines and the only one designed for quick and easy monitoring. Stopping slips made easy. We design, manufacture and sell the world's most user friendly slip test machine. It is designed for ease of use so that anyone can conduct your slip testing. SlipAlert delivers management information about your floors, about cleaning about maintenance and about changes to slip risk. We make it easy for you to manage slip risk in your business. We can help your team to understand and manage slip risks across your business. By reducing slip risks you will save time and money. We'll teach you how to analyse the slip test data so that you can make informed decisions on floor cleaning and maintenance to keep floors free from risk. Contact SlipAlert. SlipAlert measures the slip risk of floors in seconds. Results match the Pendulum which has been used around the world for over 50 years. The testing mirrors the physics of a human slip and results can be shown as Pendulum Test Values ( PTV ) or Coefficient of Friction ( CoF ). 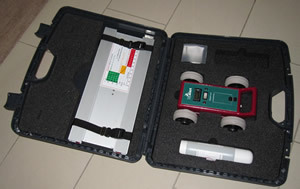 SlipAlert can measure the slip risk with any combination of floor, or contamination or footwear. SlipAlert is faster, more reliable and more accurate than other slip tests. The extra data you get from SlipAlert testing make it possible to fully understand and manage slip risks. Businesses around the world use SlipAlert test data to improve cleaning and maintenance and to reduce slip risks. SlipAlert works on all hard floors and is used in all types of business and by cleaning and flooring maintenance companies. If you want to try the global leader in slip prevention please contact SlipAlert. Talk to your Health & Safety Adviser about the importance of reducing slip accidents or contact us. The three layer model is a simple but powerful tool for understanding and managing the overall risk of slipping. Learn more about managing slip risks in your business from the 3-layer model, or our training workshops, or our free videos and resources. In the past businesses like yours waited till floors became slippery, or until someone was injured in a slipping accident. Now, you don't need to wait or worry about slipping accidents... you can be proactive. Floor safety in a box - just got even better. 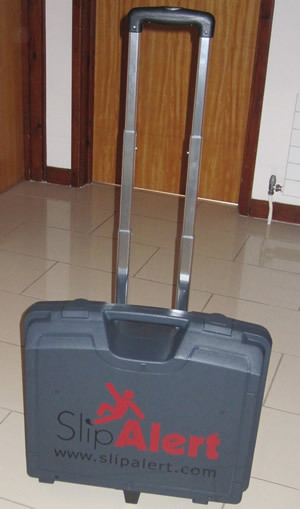 the new wheely case makes it even easier to travel around testing floors with the new British Standard and emerging global standard in floor safety. See the new wheely case. The brand new Pocket Guide to Slip Prevention is available from November 2011. It is packed with great ideas to reduce slip injuries in your business. Described as "ground-breaking" and "an invaluable tool for every flooring company" Order your free copy now. New British Standard slip testing, helps you prevent slips in your business. Our new slip prevention package, guarantees to half the number of slip injuries in your business. Watch the latest SlipAlert video. Now also on Youtube. We also want your feedback and ideas for training videos to help prevent slip injuries. Click here to see our plans and offer your ideas. Most slips start with a heel strike. As you walk or run, it is usually your heel that strikes the ground first. Learn more about slip risk with our training or free resources.